You might have noticed that I have not reviewed a lot of DC Comics here on the 365 quest. DC has never really been my thing. I mean, I dig Batman, but that’s about where my DC reading road ends. But that’s all about to change because until Sunday, it’s a DC title a day! Get ready! If you do not have much exposure to DC titles, join the club and follow along as I dive right in…eleven days in a row. 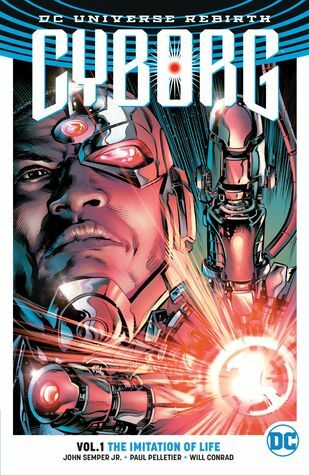 So we go from my favorite DC title of the week yesterday with Aquaman to my least favorite with Cyborg Vol. 1: The Imitation of Life from the Rebirth run. From the word go, this book was shoving exposition in my face. I felt like I was watching a television show or film that the writers assumed I was not bright enough to follow. Almost every thought, narration, and piece of dialogue was sort of insulting. The character of Cyborg is cool, and his backstory is interesting, but the way DC gives it to us reads like a book for a child who is still working on figuring out how to understand plot and make inferences. I only made it halfway through the Vol. 1 trade. I felt like I had enough. I can’t speak to the second half, and I hope the writing becomes a bit more academic as the series goes on because when we compare this trade with the Aquaman or Batgirl, considering it’s the same Rebirth Universe, we find that this book lacks maturity and creativity. I am disappointed. I was excited to discover a new DC hero with whom I had little to no experience. Maybe I need to go back to a different run to get a better take on this character.